Thanks to Brett Schulte (one link for each name) for sending the welcome news that the National Tribune is now available online here. This is outstanding news to me, though as Brett explains there are some issues with searchability. 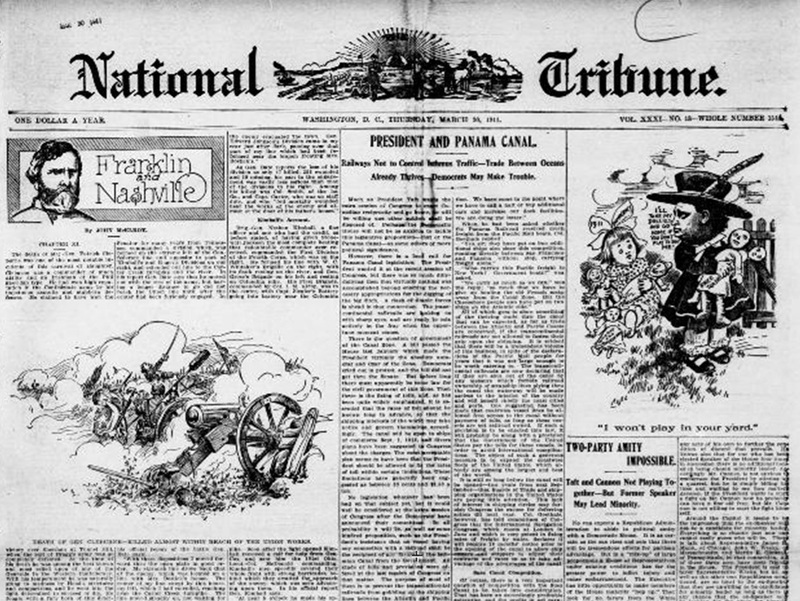 The National Tribune was a publication for Union veterans of the Civil War. Think Confederate Veteran for the good guys. It published first as a monthly, then as a weekly from, 1877 to 1917. It featured current news of interest to vets, but also had contributions from readers recounting the glory days. Columns like Fighting Them Over featured back and forth between veterans with often wildly conflicting recollections of events. UPDATE: A reader notes that there are issues missing and this is not a complete run – but it’s more than we’ve had. You can search it now, Harry, though you have to zoom in and move the page around to see what you’ve found. Bit laborious, but a good start. Thanks for the link. There is one index: Helen Ellis, _The National Tribune: A Guide to Selected Materials of Civil War Interest_, Birmingham, AL, 1968. It is about 300 pages and the one I saw at Carlisle was a carbon of the original. There is also a copy in the Library of Congress. I have been searching for years to see if another copy shows up which I would grab! No luck! If you are in the Denver area, DPL has the microfilm in the Western History Reading Room but it is not in their index! It appears to have fallen through the bibliographic cracks. I would be glad to guide you to it! Actually this the site does not have a full run. Some years are missing. I especially noticed that 1905 is missing, because I am looking for an article from that year. A Complete listing of the articles on the Gettysburg campaign has been published as an appendix in Richard Sauers, Fighting Them Over: How the Veterans Remembered Gettysburg in the pages of the National Tribune. Richard Saurers has been working on an index for several years now. he printed a short pamphlet a few years ago, supposedly completing it now. Ask Ted A about it. I forgot about that one — and I have it! The title is _To Care for Him Who Has Borne the Battle: Research Guide to Civil War Material in the National Tribune_ Jackson KY, 1995. It is labeled as volume 1, 1877-1884. It is an issue by issue table of contents. There does not appear to have ever been a volume 2. Do you know if it’s a full run of the National Tribune at DPL, or the same ones available via the link harry provides? I will check back next time I am down here and see if there is someone who has an institutional memory to guide me to them. BTW, my memory is that it was reasonably complete from the first volume into well in the 20th Century.